Thoughts from a show promoter: why we do what we do! We all have our own journeys into burlesque and I, as many others, seem to have come to it via several meandering paths leading to the same inevitable point. Like many of you I can cite a background in some sort of stage craft (for me local and student theatre), a love of crafting and costume making (been making/adapting my own clothes since the age of 16), a love of theatrical styles and/or drag (we’ve previous heard Tuesday and Ally’s inspirations in drag, mine was Priscilla Queen of the Desert) and discovering a love for burlesque on that miraculous occasion that you first discovered its existence. Another aspect for me though has always been event organising. I was going to give a rundown of my background in events, which adds up to over ten years of both paid and voluntary work, but that’s not important – what is important is where I am now. 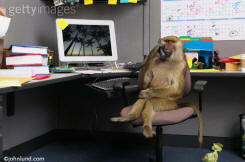 Last year I decided to leave my job as an Event and Publicity Officer, the main reason being to down size from a demanding, responsibility laden career job, to a glorified office monkey in order to put more time and effort into performing and promoting events. Several months before leaving, I had already set up my own freelance event and wedding consultancy – Burn Brightly Events. Since it started I have had dealt with private events, weddings and started up Burn Brightly Burlesque. This started with a charity show and I have since decided to run an annual charity show, with any money made from the “commercial” shows to be used to bankroll it. Tiger Tiger hard at work at her day job. As many of you know, I am very passionate about supporting, strengthening and enriching our local scene. It is great that we have such a variety of shows with a nice mix of cabaret shows, pub shows, nightclub shows and theatrical burlesque shows, and I hope my show adds something positive. At the moment all my energies are going into my upcoming show Jungle Fever: A Wild Night of Burlesque. 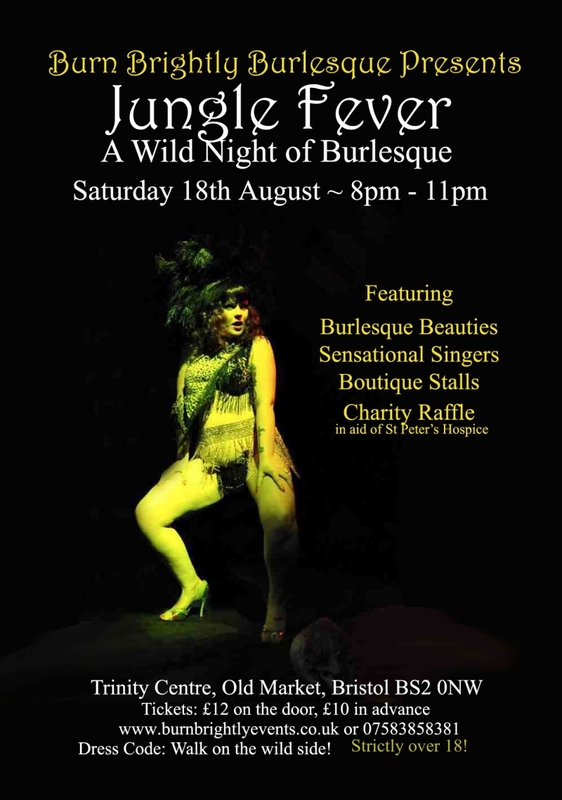 It’s going to be a theatrical and exotic evening of burlesque, with some amazing acts, boutique stalls and a charity raffle. As many of you may know, organising a show is a lot harder than many people think (especially those who have never organised one!). From budgets to bookings and the fact that performers are human, which means they are fallible. Waiting on and hassling people for information, trying to organise the venue (including when applicable, insurances, security, venue staff, etc). It can all be rather exhausting. The stress really hits you as the countdown to the show begins, a month or so before curtain up, and you are frantically counting ticket sales, trying to do as much publicity as you can, and dealing with last minute problems. Those problems vary day to day, some are big, some are small. At the end of last week the singers for my show contacted me to say they were disbanding and pulling out of the show. These things happen, and I am lucky to have contacts with many wonderful performers and replace them with another spectacular singer on the local cabaret circuit. It has meant changes to the show I had not previously intended, but on reflection, actually work and will give the show a different but equally good feel. Between sorting stuff for the show on top of my day job and performing, I haven’t got to bed before 1 or 2am most nights for the last couple of weeks. Part of it is my own fault, I actually have no ability to relax at all. Due to the cost of such a big venue and various other sundry items, I have had to pay a lot of my own money up front, in the hopes of getting it back if the show is a success. It’s a risk promoters often have to take. I feel like I’m being horrible when I am hassling performers for information that I need, and have to remind myself “this is business”. Basically it takes all the time, commitment and skills that I have built up over the years working in events to pull together one of these big shows. And at the end of the day I can only hope that people turn up, I get bums in seats and people enjoy the show. I find some friends, mostly those not connected with the performance world, looking at me like I am crazy, and asking me why on earth I do this! But isn’t it obvious, I do it because I have to. Just as my other passions, writing and performing, something within me drives this forward – something that wants to entertain, to create a dream-team of performers, to engage the audience and give them a great time. But then, I know a lot of you get that too, don’t you? More information about Jungle Fever: A Wild Night of Burlesque and other upcoming Burn Brightly Burlesque shows can be found here. Expect to see – jungle, tropical and exotic themed acts, including: stunning headliners; feats of danger; homage to performers past; fan dance; bump ‘n’ grind; Voodoo and more! PLUS, fully licensed bar, boutique stalls (including homemade cakes, fashion label, accessories, etc) and a charity raffle (raffle proceeds go to St Peter’s Hospice). This entry was posted on July 26, 2012 by coochiecrunch in Coochie Crunch Blog and tagged Burn Brightly, Promo, Tiger Tiger, Tuesday Laveau.